Lino Tagliapietra Glass Studio 2006 2nd Avenue Seattle Tel: 206 420-4867 Architect: Graham Baba Architects Seattle-based Graham Baba Architects (GBA) has transformed an existing triple-bay warehouse in the city’s Belltown neighborhood into a new studio and gallery for renowned international glass artist Lino Tagliapietra by topping the 1917-era shipping facility with a new 16-foot by 45-foot light cannon. The cavernous 6,100-square-foot, single-story space is marked by two rows of heavy timber columns, with ancillary programs discretely circulated around the ware- house’s perimeter. Visitors enter the project at street level, which sits 30 inches below the structure’s finished floor. 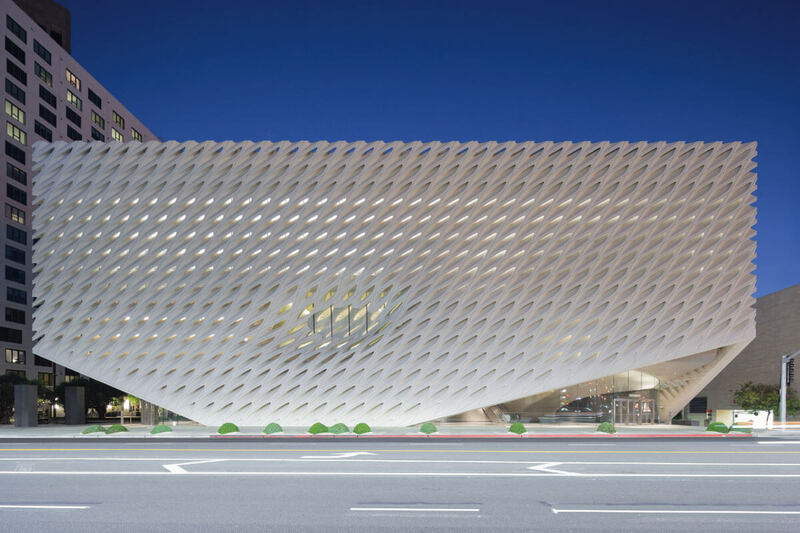 Starting at the street edge, a gently sloping ramp located at one extreme of the building carries visitors up into the gallery, bypassing a series of display cases along the way. Within the principal gallery, the aforementioned light cannon is outfitted with a curving soffit that subtly bends clerestory-derived light as it enters the continuous, gray-painted, brick-lined interiors of the space. Adjacent programs are designed to take advantage of this borrowed light and include a glass-clad office and conference room, a pair of restrooms, a kitchenette, and storage areas. 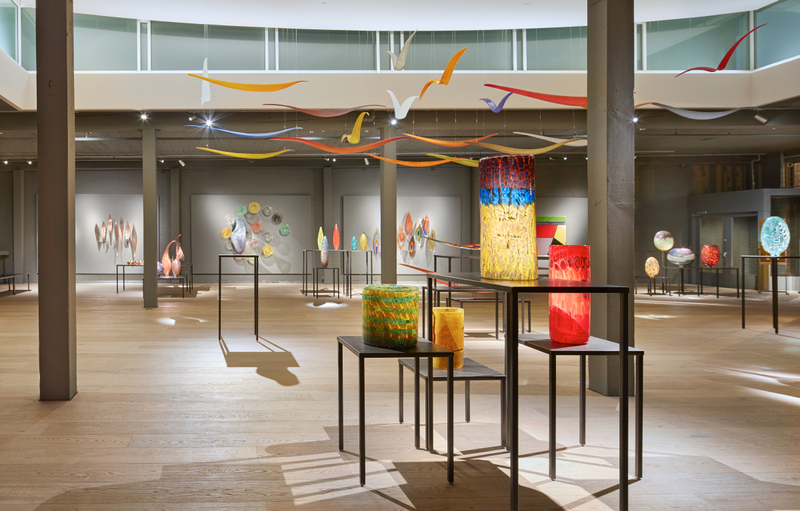 Sustainable Europly laminated wood cabinetry and furniture pieces wrap the gallery and office spaces, while art panels and drop-down mobile displays showcasing the artist’s work populate the building’s other areas. The Architect’s Newspaper will be hosting its Facades+AM conference in Seattle on December 8th at the Motif Seattle Hotel. The latest installment in AN’s ongoing conference series, Facades+AM will bring a total of three sessions and nine speakers to Emerald City–based Architecture Engineering and Construction industry professionals. The conference is co-chaired by Stephen Van Dyck, partner at LMN Architects (LMN), and will feature a bevy of Seattle-specific discussions led by some of the region’s best-known architects, designers, and engineers, including Van Dyck, Maurya McClintock of McClintock Facade Consulting, and Jim Graham of Graham Baba Architects. The morning’s panel presentations will cover three topics: cross-industry innovation, facade design for the Washington State Convention Center Addition project, and the role of historic preservation in Seattle’s ongoing construction boom. The first panel will be moderated by Van Dyck, who explained to AN that the discussion will center around the way in which Seattle’s tech-heavy economy is resulting in a collection of emerging architecture industry–adjacent technologies. The discussion will include presentations from Dan Belcher, developer with McNeel, Andry Bridge, Director of R&D with Janicki, and Choong Ng, co-founder of Vertex.AI, and will delve into synergistic technological developments coming of out the city’s most fruitful architecture and technology partnerships, like new advances in digitally-guided tooling and fabrication methodologies. The morning’s second panel discussion will zero-in on the Washington State Convention Center Addition project, for which LMN is serving as associate architect. The 1.5 million-square-foot addition to the Washington State Convention Center will usher in one of the world's first vertically-organized convention centers. One of the major challenges for the design team on the project will be to integrate the sprawling 15-story structure into surrounding areas while also promoting energy efficiency and social incubation, according to Van Dyck, who will also moderate this discussion. He will be joined by various members of the project team discussing each speaker's respective role in the project. Panelists for the discussion will be Peter Alspach, principal at ARUP, Maurya McClintock, founder of McClintock Facade Consulting, and Kate Rufe, architect at LMN. 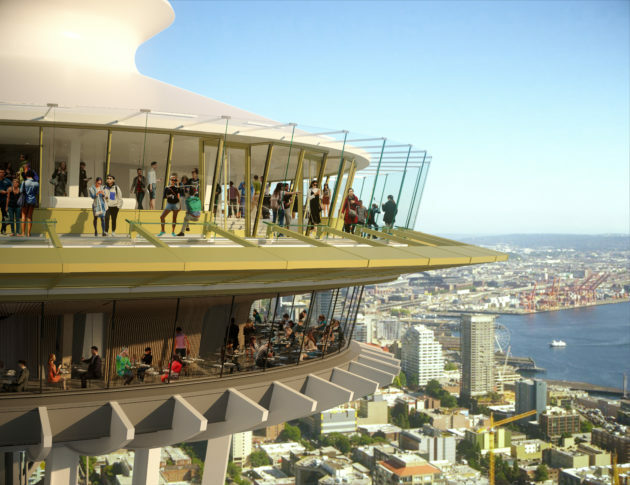 The morning’s final discussion will highlight Seattle’s ongoing growth dilemma, which is pitting high-rise residential growth and the city’s urban renewal against historic preservation efforts, many of which are aimed toward adaptive reuse, like Olson Kundig's renovations to the Seattle Space Needle. From the ongoing issues over changes coming to Lawrence Halprin’s Freeway Park, to plans for reusing the city’s iconic Key Arena and LMN’s own renovation and expansion to the Asian Art Museum, Seattle is packed with controversial, inspiring, and thoughtful historic preservation approaches alike. The adaptive reuse-focused panel—moderated by Jessica Miller, principal at LMN—will feature presentations from Blair Payson, principal at Olson Kundig, Michael Aoki-Kramer, managing principal at RDH Building Science, Inc., and Jim Graham, co-founder of Graham Baba Architects who will discuss their own firms’ preservation-related projects. For more information on Seattle’s Facades+AM conference, see the conference website. 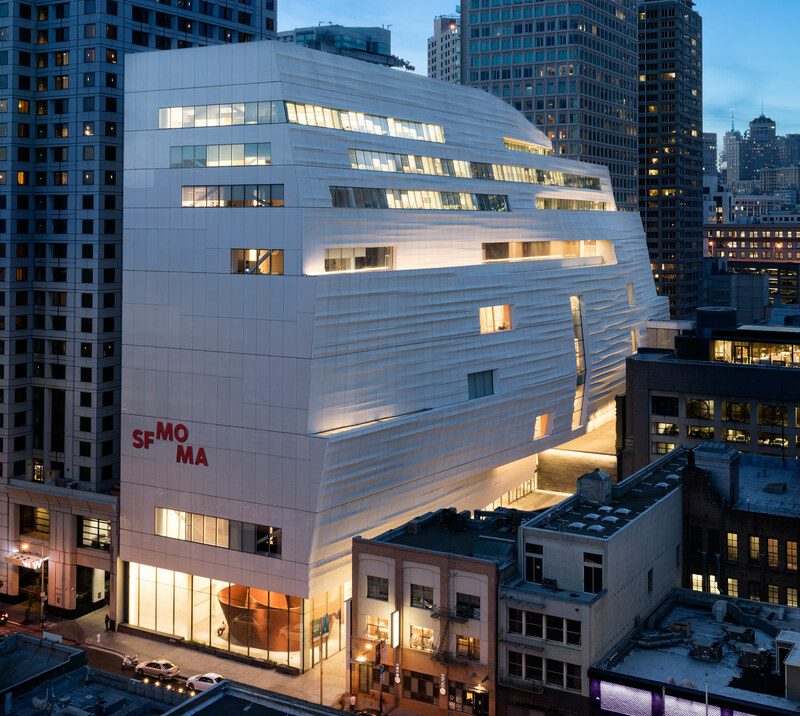 The expansion of the San Francisco Museum of Modern Art reimagines SFMOMA as a new art experience and gateway into the city of San Francisco. Snøhetta integrated the building with the existing Mario Botta design from 1995, while making the museum more accessible than ever, tripling the amount of exhibition space and expanding the public gallery and outdoor areas. Seeking to engage with the community in a proactive way, the addition opens up new routes of public circulation through the South of Market neighborhood and into the museum. Tucked behind landforms and site walls, this courtyard-focused office complex provides a serene refuge from the noise and activity of nearby fruit packing warehouses. 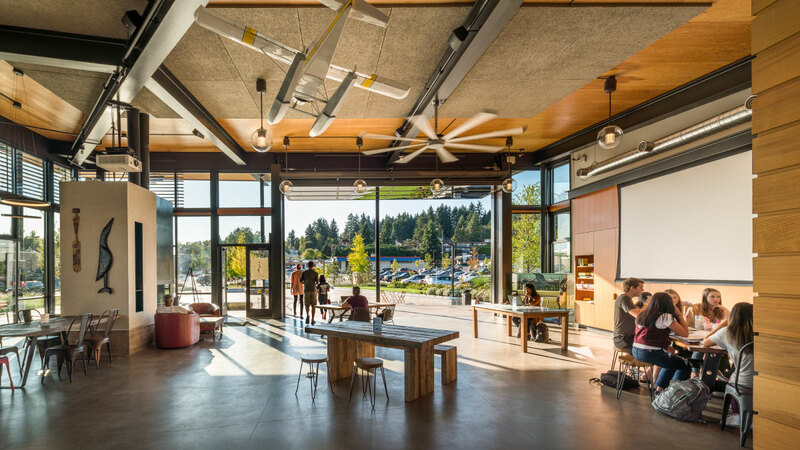 Taking cues from an aging barn, the building is light and open with a muted palette, reclaimed wood siding, and a rooted connection to the land.